Still on the hunt for that perfect gift for your Valentine? Look no further! Today only, February 9th, you can shop the Macy’s Diamond Ring Collection with styles priced at just $30.00! 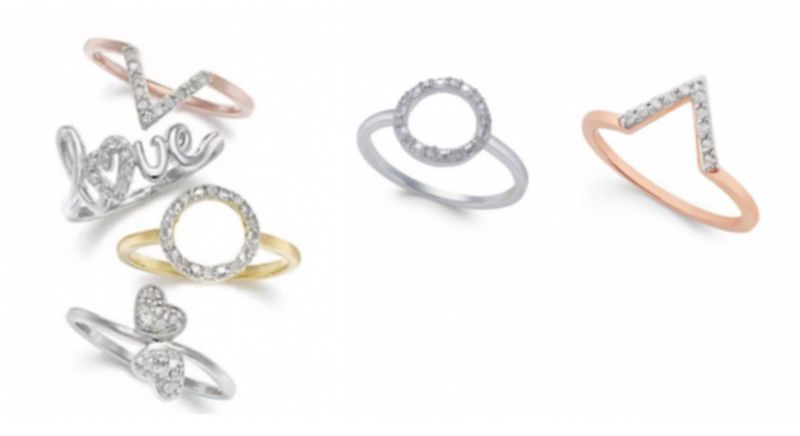 (regularly $100.00) Choose from 10 different designs with select designs available in white gold, rose gold, or gold. Plus, they will ship free! You can also shop some bonus deals with your purchase. Snag the beautiful Diamond Circle Pendant Necklace for just $59.99. (regularly $250.00) or you can a Diamond Accent Pendant for just $29.99 with purchase. Be sure to double check guaranteed arrival dates though. You may want to select free in-store pickup to make sure you get it in time for Valentine’s Day.